It's hard to remember to write reviews for games since we're often too busy actually playing the games. And given how our typical game nights cover at least 3-4 games at a time, it's easy to get lost. 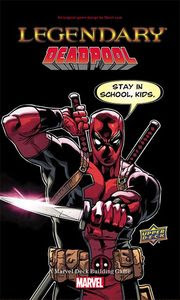 Andd thus this late review for Legendary: Deadpool, yet another expansion for one of our favorite deck building games. Sure it could have been just another movie tie-in product for a franchise game, but thankfully it wasn't. Instead it's quite the celebration of the Merc with a Mouth and all his 4th wall breaking insanity. As a smaller expansion, it's easy to underestimate this sort of thing. And when you focus on a single character, it's also easy to assume that the cards will involve a lot of variants on the same guy. But instead we got a pretty colorful set that toys around with different aspects of Deadpool's history and translate them into a really fun game. Not all small box expansions for Legendary have been quite as fun as this one. Legendary: Deadpool is a 100-card expansion for Legendary: A Marvel Deck Building Game as designed by Devin Low. The game still supports 1-5 players but requires the base game to play. This expansion gives you access to Deadpool and the Mercs for Money as playable characters. Apart from a Mercs for Money version of the titular character, you also get Bob, Agent of HYDRA, Slapstick, Solo, and Stingray. For new masterminds you get Macho Gomez, who leads Deadpool's "Friends", and Evil Deadpool, who leads the Evil Deadpool Corpse (not a typo). The set introduces the new keyword Excessive Violence, which unlocks additional abilities when you defeat an enemy with 1 extra Strike point. The set also introduces 1/2 values for stats, which willnot be enough to trigger Excessive Violence. On the villains side there's also the Revenge keyword which makes enemies stronger for each villain card in your victory pile of the matching faction. What I Liked: This set is crazy and features some of the zaniness we expect from a set of this nature. Deadpool is the craziest of the lot as he has abilities that are effected by the time you're actually playing the game and others that are based on how many cards you have that have flavor text. Slapstick has a card that is affected you relative height versus other players and Solo has a card that relies on there being a gun featured in the card artwork. The villains are an odd mix of characters from the Deadpool universe including "friends" like Blind Al and Deuce, but as villain cards. The Evil Deadpool Corpse are a quirky bunch of Deadpool-themed characters who are naturally quite similar to other heroes like Wolverinepool who looks like...Wolverine, duh. This all supports the inherent humor of the set. And I'm super happy to have a Bob, Agent of Hydra card, including the pleasant surprise of how ripped he looks in his card art. What Could Have Been Better: The addition of half points is a little funny but doesn't quite do all that much in the long run of things. Having a 1/2 point doesn't really matter most of the time and it can get a little frustrating. And I was hoping for more from this mechanic in terms of actual play, but it didn't quite feel that away apart from when you play with the Mercs for Money version of Deadpool. And of course the desire to make this game feel very Deadpool crazy-like, it naturally includes a lot of the card passing other silly rules that we had already seen with the original Deadpool card from the base set. So you end up with a whole faction of cards that has a tendency to be a little self-destruction such as randomly KO-ing you cards or enemies that can KO expensive cards from your decks. You win some and you lose some. TL;DR: Legendary: Deadpool lives up to the reputation of the character at its heart and for the most part it's a great set. If you love the Merc with a Mouth or want to fight some pretty heavy Masterminds, this is a great set to add to you collection. Thus the expansion gets 5 self-destructive card abilities out of a possible 5.